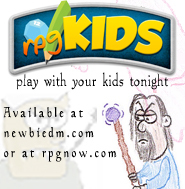 Some of you may remember rpgKids, a very rules-light rpg I developed to play with my 4 year old daughter. It was a fairly popular game (based on downloads), and I got quite a few emails and links sent to me about it. It was even included in the latest volume of the Open Game Table series of RPG Blogs Anthology, where it will forever live on in print. There were, however, some things I wished I could have done differently, both with the rules and what extras I included in the game. Well, that’s why I created rpgKids1.5, with new token artwork, a new class to play, simple magic item rules, and basic non-combat skills. It also includes a full introductory adventure “The Lair of the Frog Wizard”, which highlights all the mechanics of the game via a fun little quest. The game is available via Paypal for the very low price of $2.99. It is also available via RPGNOW. The permanent page for the game is here. If you’ve played rpgKids before, don’t worry, it’s the same game, with a few new interesting options. If you’ve never played it before, give it a try, your little ones may enjoy the heck out of it. If you decide to take a look at it, I hope you have fun with it! I have had a blast playing with my daughter, and I’m sure you will too. This is an awesome system you guys, I was given the honor of play testing this new system and it’s great. I played with a 4 year old, a 6 year old and a 9 year old (all boys) and they had a blast. It’s the perfect balance of simplicity and creativity for the more diminutive versions of ourselves. 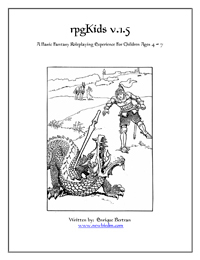 The system provides a great architecture to springboard young kids into RPG’s. Definitely worth grabbing a copy! My daughter’s 3, but I haven’t decided whether I’m going to try to get her into gaming. I just read through the book. Not only are the rules pretty tight for their simplicity, I really appreciate the blank grid page and the other maps included. Beyond running a game of RPGkids, I’d love to play the Frog Wizard story in D&D. It’s really funny.